There are a range of symptoms associated with sinusitis that can often be connected to other common illnesses such as the cold or the flu. 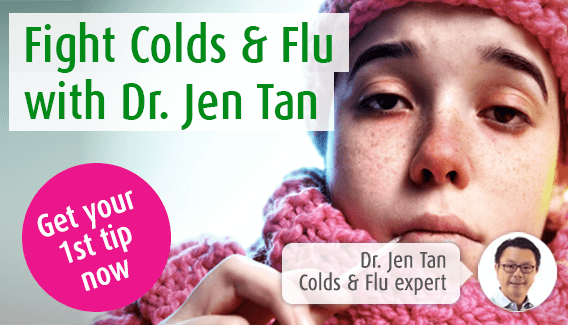 In this page, our immune system expert Dr. Jen Tan explores how sinusitis can trigger these common symptoms, and when to seek the advice of your doctor. Just about everybody knows that ‘bunged up’ feeling often associated with a cold. However, when the nasal congestion doesn’t ease with the other symptoms of the cold or flu, and you experience pain around your cheeks, forehead or eyes, the chances are you are developing the unpleasant symptoms of sinusitis. A blocked nose occurs when the lining of your nasal passages or sinuses becomes inflamed, or when there is more mucus present than normal. A runny nose occurs when the excess mucus drains away through your nose. Although it may seem unlikely that you will experience both of these symptoms simultaneously, it is not uncommon for this to occur. When the lining of your sinuses is inflamed, you will feel blocked; however, your nose may also be streaming as your immune system tries to clear accumulating mucus. The natural desire with a runny nose is to try to blow your nose and remove the loose mucus. However, this action often promotes the secretion of more mucus, and you may find your nose becoming runnier the more you blow it. The facial discomfort associated with sinusitis is often the key telltale sign of this condition. It is a signal that pressure inside your sinus cavities has increased and the lining has become sensitive. It is important to take note of where the pain occurs. Your sinuses are located above and below your eyes and either side of your nose. The pain primarily occurs in these areas, although it can sometimes spread to your forehead, teeth and upper jaw. It can be difficult to determine if you are experiencing sinus pain or toothache, and therefore considering your pain alongside other symptoms of sinusitis, and ensuring you have your teeth checked regularly by your dentist will help you to eliminate any dental problems. Our sense of smell is one of the five senses which help us to build up a picture of our surroundings. Although we perhaps do not rely on our sense of smell as much as some of our other senses, we notice its absence when our nose is blocked. We lose our sense of smell when our sinuses become blocked. Objects we can smell release molecules which travel to the top of our nose which is rich in nerve endings. These allow us to detect the molecules which are then described in our brain as scent. When your nasal passages are covered by excess mucus, the molecules are unable to reach this sensory part, and so your sense of smell is lost. Our sense of smell is also linked with our sense of taste – this is the reason that food tastes different when we have a blocked nose such as with the common cold or sinusitis. This is a particular type of headache which may be mistaken for a migraine or tension headache. This is because all three types of headache are often characterised by a dull throbbing pain, which can feel as if the pressure inside your head has increased. A sinus headache is often at its worst in the morning and may ease as the day progresses. However, moving your head quickly or a change of temperature as you go from inside to outdoors, for example, can worsen the headache. If headaches persist and the cause is unknown, it is worth seeking the advice of a doctor. Not only will this rule out any underlying causes of the headache, but will help you find an effective treatment. Struggling to breathe through your nose is a common feature of nasal congestion and sinusitis. However, if you struggle to breathe through your mouth as well, it is vital to seek medical attention immediately. Being forced to breathe through your mouth because of a blocked nose is irritating and can be uncomfortable. Although the primary cause is usually nasal congestion from too much mucus, it can also be due to nasal polyps. A nasal polyp is a small tissue growth in the nasal passage or sinuses which can cause obstruction, difficulty breathing and a reduced sense of smell. Although they are not dangerous, you may need treatment to reduce their size or surgery to remove them completely.